York Environmentalist examines how a group of Indigenous youth leaders embraced leadership in the context of HIV prevention. Being willing to listen, humble and dedicated – these are some of the successful leadership traits that Indigenous youth leaders identified when discussing HIV prevention. Sharing their stories through digital storytelling, they also viewed leadership as deeply connected to their ancestors and culture. Their stories pointed to a singular and profound statement about empathy and engagement: “When you follow your heart, you provide that path for others” − a message that will resonate in health, policy, programming and education. In partnership with the Native Youth Sexual Health Network, York Environmental Studies Professor, Sarah Flicker, came to these conclusions as they along with counterparts from the universities of Toronto, McMaster, McGill and others, studied 18 Indigenous youth leaders from across Canada in 2016. They were looking for the most successful leadership skills in the context of HIV prevention in this unique project funded by the Canadian Institutes for Health Research (CIHR) and the Ontario HIV Treatment Network. 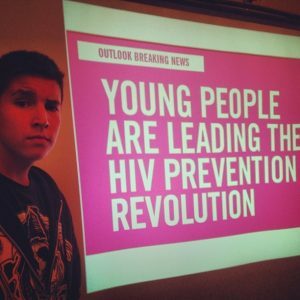 “By investing in youth leadership and by supporting Indigenous models of youth leadership, researchers, policymakers, educators and communities can gain key allies in the fight against HIV,” Flicker explains. The need is great. In Canada, HIV is on the rise among Indigenous youth, with rates of new infections currently at seven times that of non-Indigenous youth. Flicker believes that the elevated rates are likely explained by colonization, racism and poverty, and leadership could be the key to bridging the gap. They point out that models of promoting Indigenous youth leadership are noticeably absent in the literature. With leadership top of mind, the researchers explored how a group of Indigenous youth leaders, who participated in a community-based participatory action research project, Taking Action, took up the notion of leadership in the context of HIV prevention. The project planners used the word ‘action’ as a reminder of the end goal: meaningful action and social change. In this project, guided by the National Aboriginal Youth Council on HIV and AIDS, a group of community activists, researchers and students imagined new approaches to respond to the elevated rates of HIV in Indigenous communities. Importantly, in this project led by the Native Youth Sexual Health Network, team members used research methods that were collaborative, equity-based and with an emphasis on the individual’s unique contribution. In the first phase of this project, from 2007 to 2011, team members worked with more than 100 youth in six communities to create art that considered the relationship between inequity and HIV. However, youth requested more opportunities to meet with peers from different communities and learn from each other. In response to this request, Taking Action II invited Indigenous youth leaders from across Canada to a week-long retreat at York, in summer 2012. There were 18 youth from First Nations, Métis and Inuit communities, 11 female and 7 male, ranging from ages 16 to 26 years. During the retreat, the youths created three-to-five-minute digital stories or visual narratives about HIV leadership, activism and engagement. With guidance and technical support, they recreated their personal journey. At week’s end, the visual narratives were shared – a process that was emotionally arduous for many. Next, interviews were conducted with the youth where they explained their stories and discussed their feelings about being Indigenous. They were also asked what being a youth leader means to them. In a second interview, after the stories were publicly screened, the youth were asked to reflect on a concrete example of their leadership and how it felt to share their stories publicly. Leadership qualities identified by the youth included being confident, trustworthy, willing to listen, humble, patient, dedicated, resilient and healthy. The youth often returned to the idea of the importance of their ancestors and their culture to leadership. The researchers emphasize that because the youth were producers of knowledge, they could also play roles as agents of change, influencing policy, programming and education. If this were the case, Indigenous models of youth leadership, researchers, policymakers, educators and communities could work together in the fight against HIV. The article, “When you follow your heart, you provide that path for others,” was published in the International Journal of Indigenous Health (2016). To learn more about Professor Flicker’s work, visit their website.